As you can see from the photo above, we have arrived safely in Santiago. We are standing in front of the cathedaral (partially obscured by a few raindrops on the camera lens). Today's ride was only 25 miles, with some modest climbing. However, we had "Seattle rain" most of the morning, necessitating rain gear most of the time. We grouped at a cafe a couple of miles from the Cathedral so that we could navigate the city as a group. 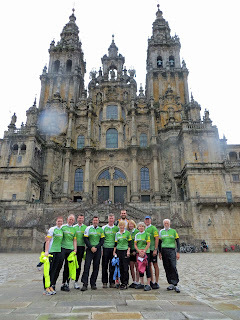 Our first stop was the pilgrim office where we produced our stamped passports, and received our compostelanas -- the certificates (in Latin, including our names) attesting to our successfully completing the pilgrimage along the way of Saint James -- the Camino de Santiago. We then had a brief visit to the cathedral, including a walk behind and above the altar where we could touch the statue of St. James which adorns the altar, and then below the altar where St. James is entombed. We then adjourned to the hotel (nice and modern again), said good bye to the bicycles that served us so well and prepared for our final day together. We have a group dinner tonight and then go our separate ways after breakfast tomorrow. 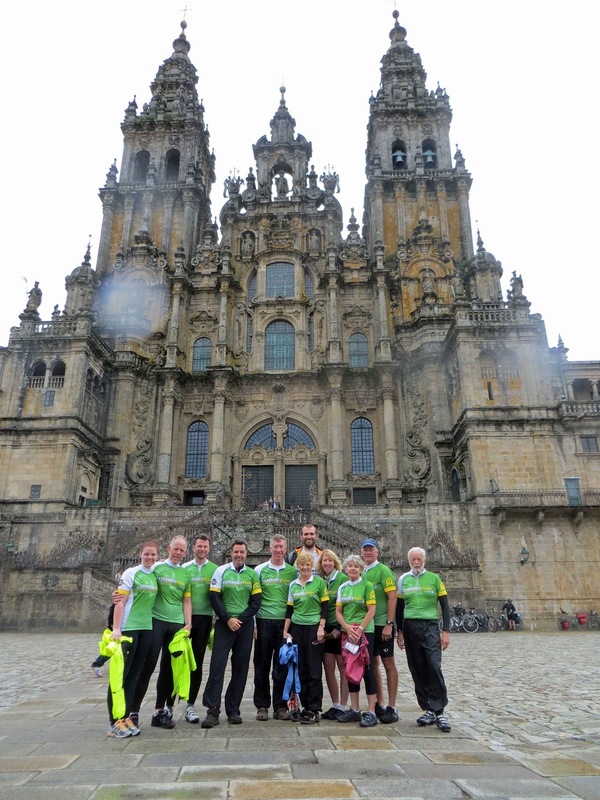 For most of us, tomorrow will include the Pilgrim's Mass at noon (Larry and Pat have an early flight tomorrow, so they biked to Santiago earlier than the rest of us, and attended the Pilgrim's Mass today). I shall do a final in-country posting tomorrow, and probably at least one more "wrap up" that I will prepare on the plane home.